ord Acton pretty much summed up Tropico 3 with these words: "Power tends to corrupt, and absolute power corrupts absolutely." In the Xbox 360 port of Kalypso's latest strategy title, we get to experience absolute power firsthand. In particular, players are able to see how each of their actions affects a population of willing subjects. Capitalism or socialism? Personal liberty or police state? In Tropico 3, it';s your decision — it's your island. A world building simulation in the vein of Simcity or Civilization, Tropico 3 is all about making a profit while maintaining the day-to-day operations of your small island state during the height of the Cold War. The road you take to prosperity is entirely up to you. Adopt hardline socialism and the Soviets will support you with financial assistance and infrastructure upgrades; embrace the free market, and the Americans will soon be knocking at your door. Of course, you'll also have to contend with the various political/social factions present on your own island — the academics will encourage you to invest in higher education and literacy programs while the faithful will ask for new places to worship and a conservative social agenda. It's a balancing act, and the slightest shift towards one group or another can drastically affect life on your island. Motivating laborers can be hard work.With the tools at your disposal, you're able to track the happiness of your island's factions (or even individual subjects) in real time. The almanac presents economic figures and demographic data in a clear and concise manner, while a series of topographic overlays illustrate trouble spots (such as high crime areas or inadequacies in the electrical grid). Navigating these tools is simple enough, but isn't nearly as intuitive a process as it was on the PC. Like far too many console strategy titles, Tropico 3 stumbles when it comes to control and navigation — selecting objects and manipulating the camera view aren';t impossible tasks using the Xbox's controller, but they're ten times easier with a keyboard and mouse. 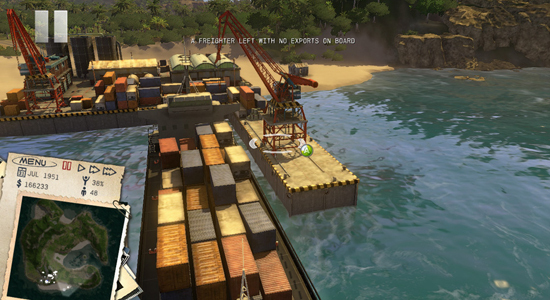 Tropico 3's deliberate pacing helps matters a great deal. Events play out over the course of months and years rather than seconds, so a short delay in changing a farm's output or setting up a construction project isn't going to be the end of the world. Halo Wars this is not, after all. Provided you're playing Tropico 3 on a high definition display, there's little to fault in its presentation. Structures are easy to spot, art is serviceable yet lush and the game's music never becomes too grating. Any problems with Tropico 3's visuals tend to stem from the game's poor camera control — for instance, certain structures need to be linked to roads, but connecting the two can be nearly impossible at specific viewing angles. A keyboard and mouse simply proved a better way to zip across the landscape. Is Tropico 3 a worthy investment? There are few games like this on the 360, and despite the shortcomings of its user interface, this is one game that strategy fans owe it to themselves to experience. Still, if you have the opportunity to play it on a PC, that's probably the safer bet. As far as the strategy genre has come on home consoles in recent years, it still has a long way to go. That's a shame about the controls, but it sounds like a feasible alternative if you don't have a PC up to the task. I love Tropico 3, but sadly it doesn't produce much of a challenge for me. The game is beautiful though, and if you like city/world building, you'll love it. I can't imagine anyone playing this on 360, however. Like Ed said; it's not bad on a 360, but it's way better on a PC. I played the hell out of the demo on my XBox and absolutely love it, but I'm sure it's smoother to play on a computer.